According to new data from comScore released this morning, more than half (53 percent) of Wi-Fi households in the U.S. are now using at least one over-the-top streaming service, with Netflix being the primary choice. While still the leader in the streaming space with a presence in 75 percent of those homes, its service is facing increased competition from others — including most notably YouTube, which has grown its reach to 53 percent, trailed by Amazon at 33 percent and Hulu at 17 percent. The data was collected in December 2016, when there were more than 49 million Wi-Fi-connected homes in the U.S. streaming video content over the internet through one of these over-the-top services. In total, there are today 11 streaming services that reach one million or more homes in a given month, said comScore, noting the market’s expansion beyond Netflix’s earlier dominance. These services are stepping in to fill the void left by traditional television, in most cases. Their subscribers are heavily engaged, the study found, watching over-the-top content an average of 19 days per month, for 2.2 hours per day. And the highest concentration of their viewing takes place during traditional prime-time hours. That’s another indication that consumers have cut the cord with traditional cable TV, but continue to watch TV much as they had before — that is, to unwind after work and catch up on favorite shows before heading to bed. 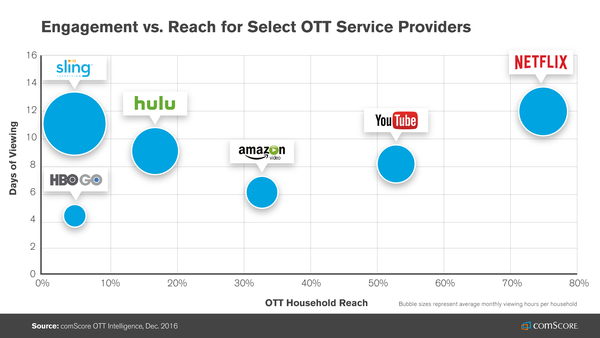 However, while Netflix leads the pack in terms of reach, it’s only No. 2 in terms of engagement, with viewers averaging 28 hours per month of watch time. Dish’s live TV service, Sling TV, was far ahead with 47 viewing hours per month. ComScore didn’t speculate why that was the case, but it’s likely because Sling offers an experience that essentially mimics cable television. This appeals to those more hesitant to fully cut the cord — a trend that tends to go hand-in-hand with watching less TV overall, especially among younger viewers. Sling TV subscribers instead may still be watching TV like usual, just in a different format — streamed online, not piped in through cable or satellite. Their viewing behavior hasn’t really changed in that case, only the way they access TV. In addition, while 3 out of every 4 over-the-top homes were watching Netflix, comScore points out that means there are 25 percent of homes that are only watching competing services. In these homes, they’re not all necessarily turning to a direct rival like Amazon or Hulu, but are often tuned into internet video. For example, more than 30 percent of YouTube and Twitch’s TV audiences don’t watch Netflix on TV; for Hulu, that number is 14 percent. Netflix’s rival Amazon Video is also finding an expanded reach thanks to the popularity of its Fire TV platform, including the Fire TV Stick and Fire TV streaming player. On this platform, Amazon has — not surprisingly — become the top streaming service. Netflix is No. 1 on everything else, from Roku to game consoles and more. In other words, the more Fire TV devices Amazon sells, the more it can increase its over-the-top market share. Though it sometimes seems like Netflix is ubiquitous — it has been said to have been reaching U.S. market saturation for some time — comScore argues that there’s still room for growth. Its data indicates that around half of the U.S. Wi-Fi-connected households didn’t engage with an over-the-top service in December 2016, which leads to a big opportunity for the various players. 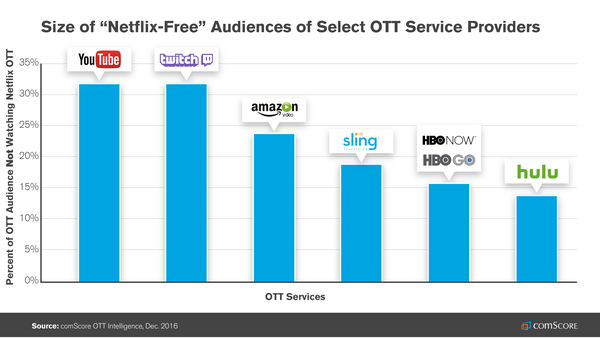 But with the newer crop of streaming TV services — like Hulu’s forthcoming live TV service, AT&T’s DirecTV Now, Sony’s PlayStation Vue, YouTube TV, Sling TV and perhaps entries from Comcast and Verizon [disclosure: Verizon owns TechCrunch parent AOL] — it’s not clear that Netflix will retain the lead when these households finally enter the over-the-top market.